Soldiers in Uzbekistan have sealed off the eastern town of Andijan, where some 2,000 protesters are gathered following an overnight jailbreak. Some of those freed from jail are leading the protest, and include 23 local businessmen who were facing trial on charges of Islamic extremism. Their families say the men are innocent and have been unfairly targeted. President Islam Karimov reportedly left for Andijan several hours ago but his current whereabouts are unknown. Earlier, shots were fired into the crowd. Nine people were killed and 34 injured, according to government officials. Protesters are calling for "justice" and "freedom". The BBC's correspondent in Tashkent, Monica Whitlock, says the unrest feeds on long pent-up anger in Andijan regarding the treatment of prisoners, poverty, unemployment and other social problems. Overnight, a group of unidentified armed men broke open Andijan jail, freeing everyone inside - perhaps as many as 4,000 inmates, both political prisoners and ordinary criminals. They poured out into the city, some of them carrying guns. "The people have risen," AP news agency quoted Valijon Atakhonjonov, the brother of a defendant in the long-running trial. Some protesters have occupied the mayor's office in Andijan, while the majority are in the main square. Earlier, three snipers were reportedly pulled down from a roof by protesters. An official in Uzbekistan's foreign ministry, who described the protesters as "armed criminals", said negotiations with them were under way. Almost all the roads to the city centre are now blocked, and the demonstrators control the area. All foreign news broadcasts, including those of the BBC, have been blocked. In the capital Tashkent, 300 km away, a man was shot dead outside the Israeli embassy, upon suspicion he was a suicide bomber. Our correspondent says the incident, while apparently unrelated to the protests, shows how tense the situation has become. Andijan is one of the main cities in the most politically sensitive part of this country, our correspondent says. It is the barometer of feeling for a long, densely populated valley called Ferghana with a long tradition of independent thought, and the authoritarian government in Tashkent has always eyed the valley with suspicion, she says. The government has locked up probably thousands of local young men, many of them prominent members of the community, accusing them of Islamic extremism. Neighbouring Tajikistan and Kyrgyzstan have shut their borders with Uzbekistan. Protests in Kyrgyzstan in March resulted in the overthrow of its then President, Askar Akayev. Are you in Uzbekistan, or do you have friends or family there? What do you think lies behind the unrest? Send us your comments and experiences using the form below. I have many friends in Tashkent. In my point of view, the situation in Andijan is like that we saw in bordering Kyrgyzstan. The dictator president uses his power against his own people in order to ensure his power. The opposition in Uzbekistan has no opportunity to say a word. All the arrests are unfair and not democratic. I think the West should rethink their relationship with Uzbekistan. For a long time Islamic extremists have been attempting to overthrow Islam Karimov. Scores of suicide operations have been launched in Uzbekistan over the years by terrorists in order to overthrow Karimov. Even though Karimov is a dictator without him there will be great anarchy and the return of a primitive society. This is an attempt to overthrow Karimov. Uzbekistan is indeed ran by a secular dictator, but having him is better than having a fundamentalist Islamic regime. I hope that democracy will be established. This is all happening at the instigation of Western powers who perceive Karimov as pro Moscow. This is one more facet of a 'Velvet' revolution being engineered not by indigenous people but by so-called custodians of democracy and liberal society. The international community's first responsibility should be to help the Uzbek government in containing this unrest and a speedy return to normalcy, instead of using it as propaganda to spread this unrest to unaffected areas within Uzbekistan. I have friends in Uzbekistan. Much of the hatred towards the government there is because the people want to be ruled by Islam. The Uzbek leader has responded to this with force by locking up anyone who vocally opposes the current establishment is favour of Islamic rule. My friends there tell me that the presence of US forces has compounded the problem. Karimov rounds up so-called "terrorists and Islamic extremists" because he gets financial aid from the US for taking a hard line. Uzbekistan does not have anything like a terrorist problem. My family live close to Andijan. I think the events were organised by a small group of people, most probably related to the group of convicts whose court case was going on in Andijan. The majority of the protesters poured in the streets have little to do with radical Islamists who probably triggered the events. The main cause of popular unrest is the economic and political homeland policy of the government. If Western powers don't get involved a horrible tragedy will happen. The current leadership wouldn't hesitate to spill the blood of thousands to remain in power. Here is the chance to bring the democracy to my country. Please do not demonise the protesters as Islamic radicals. The majority of them are ordinary people who strive for survival and want happiness. The main reason of this unrest is the dictatorially corrupted policies of the president Karimov's regime. Uzbekistan is characterized by steadily expanding economic stagnation, high level of unemployment, systematic human rights violations and repression of any political dissent including Muslim religious groups. God bless our brothers and sisters in Uzbekistan. It is difficult to be diplomatic and express feelings in the correct way at that moment, but being Uzbek and leaving abroad I could only say "I wish I was there". I love my country but many Uzbeks like me had to leave the country for different reasons, it is unsafe politically and in common life and I was becoming desperate in the job hunt and family concerns. You do not have to be an Islamic extremist in order to be threatened by police in your daily life in Uzbekistan. That has to stop! We are desperate for freedom and cannot stand the permissiveness of the state and its officers anymore. The Uzbek regime is nothing but an oppressive police state. 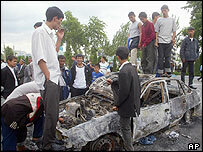 I hope this is a popular uprising as we saw in Kyrgyzstan... just without any more bloodshed. The people of Uzbekistan deserve better than what their government has given them. Next should be Tajikistan. I think people are utterly disgusted by government's actions, by groundlessly accusing its opposition of terrorism and jailing people unjustly. Another reason is obviously poverty and lack of freedom of speech. This demonstration on the streets is due to the inefficient measures taken by the authorities, and the government has acted truly unprofessionally by denying its citizens their human rights. However, this tyranny and authoritarian government must come to end and this is the time for our people to come forth. We must fight for our freedom and bring justice to those culprits who have victimised thousands of innocent people. As the people of Uzbekistan, we assure to the world that there is no terrorists in the country, and this notion is been architected by the government in order to grab more budget from the US for their personal sake. Uzbekistan is my country but I moved to Canada 10 months ago. Life in Uzbekistan is very, very hard, hence I moved here with my mother. My father is in the states and he's trying to get refugee status, because he had a problem from the government and Islamic groups, they tried to frighten him and all our family. So for me it's really important to have freedom in Uzbekistan, I don't want to see my children there. I think the people can't suffer any more. I have just received the horrible news but I hope my family will be safe and that this protest will be successful and make the country better that what it is at the moment. People run out of the jail because there are thousands of innocent people inside. I hope this situation will be more democratic in the very near future. And this is HOW it should be. What lies behind Uzbek protests?